Lui, Yuan Chow and his dad Jim at the Ribbon Run 2013. Lui, Yuan Chow was 7-years-old when he moved to Melborne, Australia with his family. 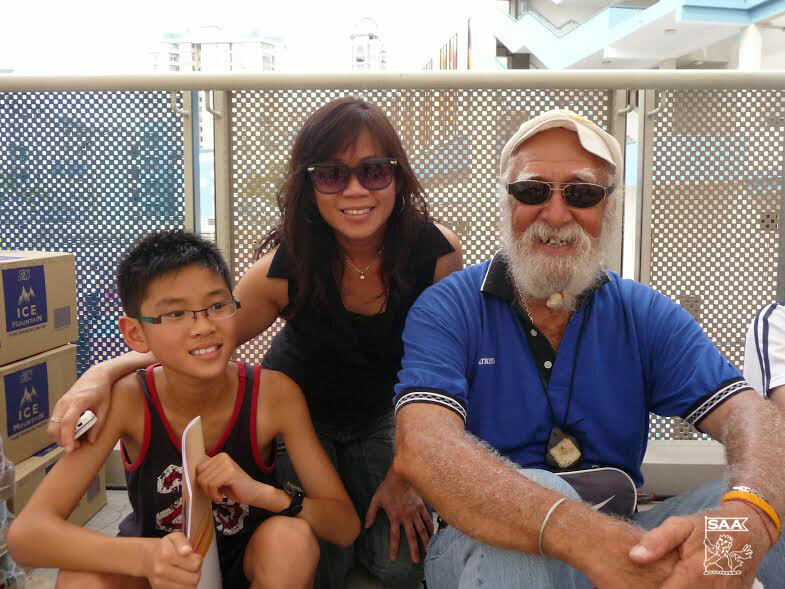 His dad Jim, a former sprints and jumps athlete during his younger days in Singapore, he slowly began to notice that his son was picking up his same interest. The younger Lui began to devote more time and effort in his pursuit of athletics. 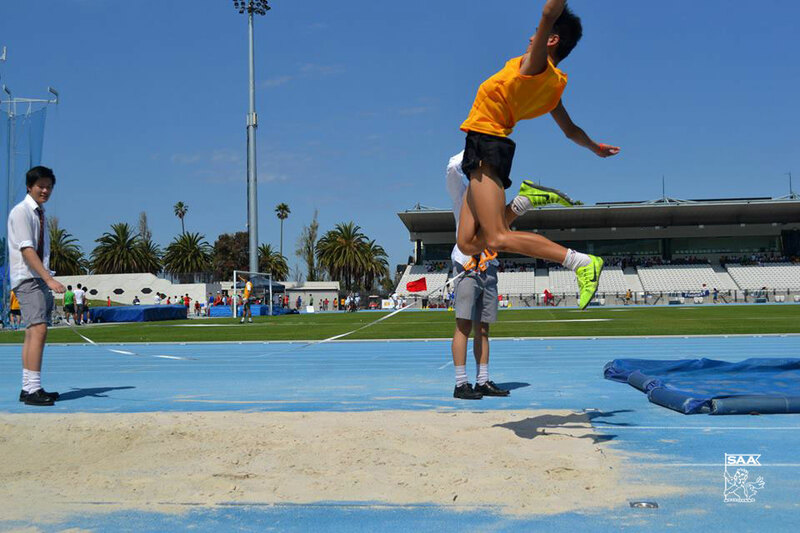 Under the tutelage of his father and the occasional coaching of reknown Aussie coach Tom Kelly, the 1.72 metres tall Chow began to set personal bests. Lui, Yuan Chow at the Zatopek.10 event. 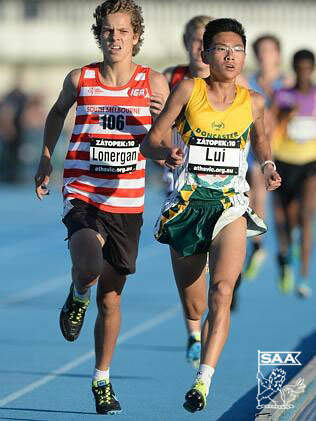 Late in the year 2013, Lui, Yuan Chow had a breakthrough when he ran 4:15.81 (12 Dec 2013) at the Zatopek.10 event. 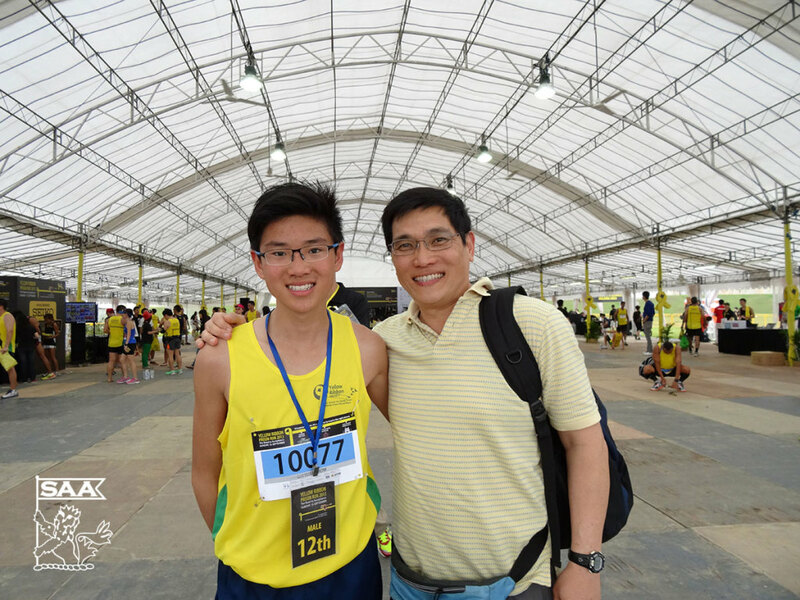 His father Jim, consulted Singapore coach Patrick Zehnder who discovered that the timing was faster than the current Under-15 age-group 1500m record of 4:16.78 held by Sarvinder Singh set in 1984. The 29-year-old record was finally replaced and the new record officially ratified in January 2015. Congratulations. Below is an extract of Lui, Yuan Chow‘s interview. How does it feel to be the new U15 age-group 1500m boys record holder? To be in the record books of many impressive athletes that have run before me is an honour. I never really expected to break it so now I just hope I can keep working and turn this success into more successes. You broke Sarvindar Singh’s 29-year-old 1500m U15 boys record. Do you know who Sarvindar Singh was, or who held the record before you broke it? To be honest, I did not actually know what the record was for the 1500m U15 boys, little to say who held it. I was only told about it through my dad about 6 months after I broke the record, so it was quite an anti-climatic surprise. Given a choice, which is your favorite event? Lui, Yuan Chow has a PB of 5.93m in the long jump. I like most of the events in Athletics, but not so much the throws. A twig like me couldn’t even lift the shot put, let alone throw it. I have to say Long Jump is my favourite apart from the distance. The exhilaration from exploding off the board and hanging in the air is something I can’t really express in words. Therefore if I had to choose I would go with long jump. What are your other passions other than running? I can’t pinpoint exactly what I am passionate about, but apart from running, I do enjoy basketball, table tennis, badminton, cricket and chess. Long term goals, where do you see yourself in 5 to 10 years down the road? Will you still be pursuing athletics? My Dad once told me, “A true champion is someone who is able to run at a very old age and still enjoys it”. Athletics will always be a part of me so I see myself running for a very long time. How far I make it on the other hand, is something else. If life allows me to train hard and if I do have the talent to make it big, then I’m willing to dedicate the time and effort into doing so. 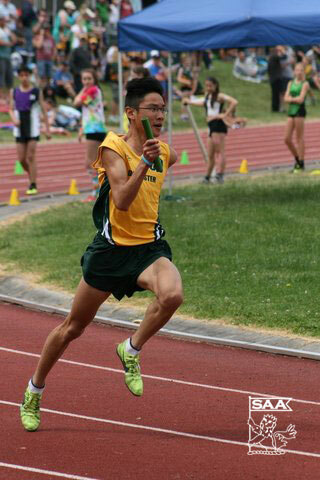 A recent photo of Lui, Yuan Chow at the Box Hill Relay. I train averagely 5-6 times a week nearing competitions, but through the season it varies and is quite flexible in the sense that I would cater how hard and how often I train to how my body feels (whether I am in good physical condition), and also to many other factors like type of events, school activities, etc. What is your training like? Perhaps a snippet of what your training load weekly is like? My training varies week to week and my dad plans the program for me. We heighten the load with upcoming major competitions, and then taper off about 2 weeks before the competition. I don’t necessarily go all out in every single training session – it can be more damaging than beneficial to be over-training so it is very important to get to know your body well. Giving your body enough rest after a hard session is just as important and is as big a focus as training. My family is vegetarian (Almost Vegan), but in terms of taking care of my diet, I’m not at the level where I am dedicated enough to restrict to just healthy foods. I veer off course quite often and eat junk like chips and sweets as most teenagers do. How is the support from your family and friends regarding your running endeavors. A young Lui, Yuan Chow in 2010 with coach Patrick Zehnder. Support has always been there. My family has been to many of my races and my parents have never failed to be there – at least one of them will always be there to watch me run. If it weren’t for my family I’m not sure if I would have made it this far. What has athletics taught you? One cannot achieve anything without putting in time and effort. Like many things, if you want to be successful, there isn’t a shortcut. Talent will not get you anywhere without effort, and of course, consistent effort requires discipline, determination and motivation. I found that staying determined throughout the season can also be challenging. Also there are always ups and downs and for athletes, one of the down sides is injury. With them, it is a matter of coping and learning from the setback. Do you miss Singapore? How often do you fly back to visit. After returning to Singapore about a year ago, I have come to notice a number of differences between the two countries. Singapore’s weather is relatively humid and hot, and there are people everywhere. It’s not something I’m very comfortable with after having lived under Australia’s cool weather condition for the past 8 years. In those 8 years I have built many strong relationships in Australia, which I never had a chance to establish in Singapore. My first competition in Singapore was the Yellow Ribbon Run in 2013; I still remember vividly that we arrived in Singapore at midnight and did the race on the same day. It was my first race in Singapore and I felt excited despite feeling lethargic due to lack of sleep and have yet to adjust to the weather. Planning to be back this Sep/Oct period & hope to be able to participate in some races. Photos courtesy of Jim Lui.